John Wang received his Ph.D. in Microbiology from University of Virginia in 2001. He was a postdoctoral fellow with Dr. Bert Vogelstein in the Sydney Kimmel Comprehensive Cancer Center at Johns Hopkins University. 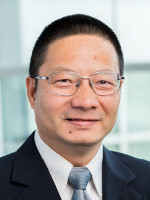 Dr. Wang joined the Department of Genetics and the Case Comprehensive Cancer Center in August, 2005. He has been co-leader of the GI cancer genetics program at Case Comprehensive Cancer Center since 2014. He was named as a co-leader of the Standup to Cancer (SU2C) Colorectal Cancer Dream Team in 2017. Dr. Wang's research program focuses on defining mechanisms of oncogenesis at the molecular, regulatory and phenotypic levels and translating these discoveries to new cancer therapies. Dr. Wang co-discovered that PIK3CA, which encodes p110a catalytic subunit of PI3 kinase, is frequently mutated in human cancers. His laboratory recently found that PIK3CA mutations render colorectal cancer dependent on glutamine. He has successfully translated these discoveries into ongoing phase I/II clinical trials. This line of research is currently funded by a SU2C colorectal cancer Dream Team award, the Case GI SPORE and an RO1 from the National Cancer Institute. Dr. Wang also is interested in defining the roles of pseudo-kinases and pseudo-phosphatases in tumorigenesis. The human genome encodes 48 pseudo-kinases and 17 pseudo-phosphatases, which are thought to be enzymatically inactive. However, his laboratory recently discovered that the pseudo-phosphatase domain of protein tyrosine phosphatase receptor T (PTPRT) is in fact an active enzyme which removes nitration (NO2) from tyrosine residues in proteins. His lab has demonstrated that this denitrase functions as a tumor suppressor (https://www.biorxiv.org/content/early/2017/12/22/238980). Adverse Clinical Outcome Associated With Mutations That Typify African American Colorectal Cancers. Genetic alterations of protein tyrosine phosphatases in human cancers. Gain of Interaction with IRS1 by p110α-Helical Domain Mutants Is Crucial for Their Oncogenic Functions. Identification and functional characterization of p130Cas as a substrate of protein tyrosine phosphatase nonreceptor 14. DNMT1 Stability Is Regulated by Proteins Coordinating Deubiquitination and Acetylation-Driven Ubiquitination. Identification and functional characterization of paxillin as a target of protein tyrosine phosphatase receptor T.
Identification of STAT3 as a substrate of receptor protein tyrosine phosphatase T.
Wang Z, Shen D, Parsons W, Bardelli A, Sager J, Szabo S, Ptak J, Silliman N, Peters BA, van der Heijden MS, Parmigiani G, Yan H, Wang TL, Riggins G, Powell S, M,James, Willson KV, Markowitz S, Kinzler KW, Vogelstein B, and Velculescu VE. Samuels Y, Wang Z, Bardelli A, Silliman N, Ptak J, Szabo S, Yan H, Gazdar A, Powell SM, Riggins GJ, Willson JK, Markowitz S, Kinzler KW, Vogelstein B, Velculescu VE.